The fact that I like to collect geeky things is common knowledge in my family. While they're supportive of my hobbies, I know they think I'm downright weird sometimes. The geekiest thing anyone in my family owns is my dad's Collector's Edition boxed set of the original Star Wars Trilogy in VHS. Yep, VHS– which dates it back to the 80s. That being said, my sister finding Hero Crate is pretty awesome– especially since my sister and I are fairly opposite. She usually steps out the door with perfect hair and makeup with stylishly manicured nails wearing something from Nordstrom. I step out in cut off sweatpants and a Dr. Who shirt I bought on Teefury.com. In fact, the other week we were in a Lego store. Heads are turning in my sister's direction and she looks uncomfortable but is politely patient. 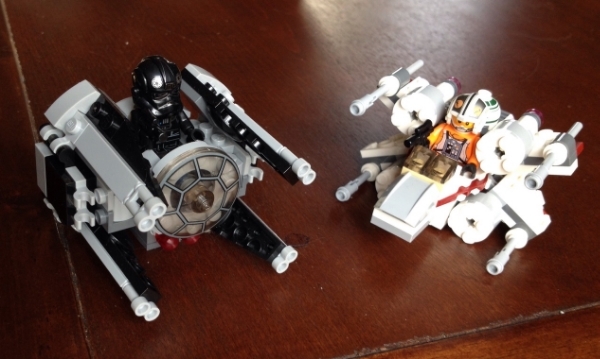 I pick out a Star Wars X-Wing and a Tie Fighter kit and ask, "Which one should I get?" and she shrugs and says, "Um, I dunno. They're both cool I guess". So I bought both. I think this is a common problem with me– when faced with a decision, especially when choosing between miniatures, I'm like the little girl in the "Why Not Both?" meme. That would explain where all my money goes. Speaking of monetary investments, it's about time I started one of the Darksword Kickstarter miniatures. While I'll be finishing my experiment with gold NMM, I'd like to choose one to paint. I'll narrow it down in the next two days and do a #SurveySaturday on my @Mocha_Minis account in the morning before I start painting. Sometimes, I just need more opinions– especially when I've been staring at my choices for far too long! Ah, decisions, decisions.